In a perfect world, dogs don't bite humans unless they really deserve it. But alas, we can't always make dogs deny their instincts, and if they believe that they or you are being threatened, they may bite someone who doesn't deserve it. Haunted by the horrible mauling of a child by three pit bulls in Germany several years ago, the Swiss inventor, Tim Saciri, lost sleep night after night until he figured out a way to prevent the deadly damage a guard dog, or just a dog with a bad temperament, can do. Saciri and his wife have been working on the Bite Guard for three years and it is now available for sale in Switzerland. 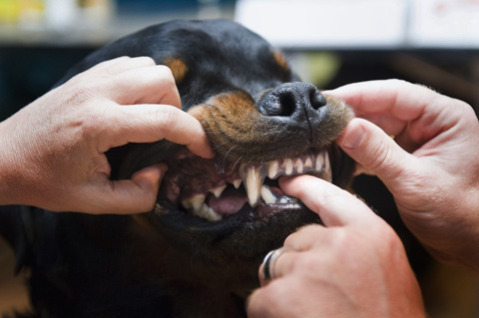 Although Swiss officials report that only about seven persons seek medical attention for dog bites every year, the Swiss Army and researchers from Bern University are testing the Bite Guard on dogs. Reportedly, one of the German Shepherds testing the custom-fitted Bite Guard was not able to pop a balloon with the thermoplastic shield covering his teeth. Dogs trained as attack animals or guards would still be able to stop a threatening person dead in his or her tracks, but the Bite Guard might prevent the dog attack from becoming a deadly attack. Technology Used For Good! The Animal Video Of The Day!! !